In 1926, three brothers, Adriano, Marcello and Bruno Ducati, founded Societa Scientifica Radio Brevetti Ducati in Bologna to produce vacuum tubes, condensers and other radio components, becoming successful enough by 1935 to construct a new factory in the Borgo Panigale area of the city. Production was maintained during World War II, despite the Ducati factory being a repeated target for Allied bombing. Meanwhile, at the small Turinese firm SIATA (Societa Italiana per Applicazioni Tecniche Auto-Aviatorie), Aldo Farinelli began developing a small pushrod engine for mounting on bicycles. Barely a month after the official liberation of Italy in 1944, SIATA announced its intention to sell this engine, called the "Cucciolo" (Italian for "puppy," in reference to the distinctive exhaust sound) to the public. The first Cucciolos were available alone, to be mounted on standard bicycles, by the buyer; however, businessmen soon bought the little engines in quantity, and offered complete motorized-bicycle units for sale. In 1950, after more than 200,000 Cucciolos had been sold, in collaboration with SIATA, the Ducati firm finally offered its own Cucciolo-based motorcycle. This first Ducati motorcycle was a 60 cc bike weighing 98 lb (44 kg) with a top speed of 40 mph (64 km/h) had a 15 mm carburetor giving just under 200 mpg (85 km/L). Ducati soon dropped the Cucciolo name in favor of "55M" and "65TL". When the market moved toward larger motorcycles, Ducati management decided to respond, making an impression at an early-1952 Milan show, introducing their 65TS cycle and Cruiser (a four-stroke motor scooter). Despite being described as the most interesting new machine at the 1952 show, the Cruiser was not a great success, and only a few thousand were made over a two-year period before the model ceased production. In 1953, management split the company into two separate entities, Ducati Meccanica SpA and Ducati Elettronica, in acknowledgment of its diverging motorcycle and electronics product lines. Ducati Elettronica became Ducati Energia SpA in the eighties. Dr. Giuseppe Montano took over as head of Ducati Meccanica SpA and the Borgo Panigale factory was modernized with government assistance. By 1954, Ducati Meccanica SpA had increased production to 120 bikes a day. In the 1960s, Ducati earned its place in motorcycling history by producing the then fastest 250 cc road bike available, the Mach 1. 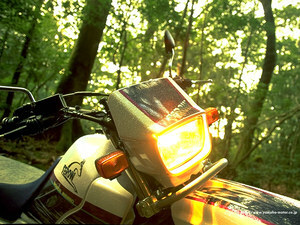 In the 1970s Ducati began producing large-displacement L-twin (i.e. a 90° V-twin) motorcycles and in 1973, released an L-twin with the trademarked desmodromic valve design. In 1985, Cagiva bought Ducati and planned to rebadge Ducati motorcycles with the lesser-known Cagiva name (at least outside of Italy). By the time the purchase was completed, Cagiva kept the "Ducati" name on its motorcycles. In 1996, Texas Pacific Group bought a 51% stake in the company for US$325 million; then, in 1998, bought most of the remaining 49% to become the sole owner of Ducati. In 1999, TPG issued an IPO of Ducati stock and renamed the company Ducati Motor Holding SpA. TPG sold over 65% of its shares in Ducati, leaving TPG the majority shareholder. In December 2005, Ducati returned to Italian ownership with the sale of Texas Pacific's stake (minus one share) to Investindustrial Holdings, the investment fund of Carlo and Andrea Bonomi. From the 1960s to the 1990s, the Spanish company MotoTrans licensed Ducati engines and produced motorcycles that, although they incorporated subtle differences, were clearly Ducati-derived. MotoTrans's most notable machine was the 250 cc 24 Horas (Spanish for 24 hours).